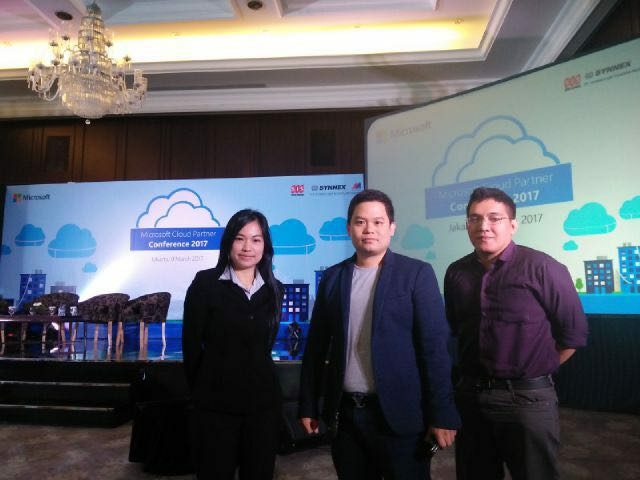 On Thursday, 9 March 2017 DIT as a Microsoft Partner in Cloud Computing System were invited to attend the Microsoft Cloud Technology Partners Conference 2017 at Royal Kuningan Hotel, Jakarta. Microsoft Cloud Partners Conference is the place where partners from Indonesia will come together to learn about the evolution of Microsoft technologies, participate in engaging sessions and keynotes, network with peers and discover how align their business more effectively with Microsoft to increase profits and win new business. The values we learned from the conference was telling us about “Make digital transformation and help you define your future”. This conference was also attended by great speakers from Microsoft Indonesia like Rudy Sumadi as a SMB Lead, Reza Topobroto as Director of Legal Affairs, Julius Fenata as Technical Evangelist-Azure, Antonius Susanto as PBnd Lead and Deon Oswari as PCDM. What made it go well, they also presented Partner Talkshow with Bizzy, Opsigo and Enerren. By participating this event, we learned more about building connections which we need to elevate our future business, gain competitive advantages and also provide high customer satisfaction.